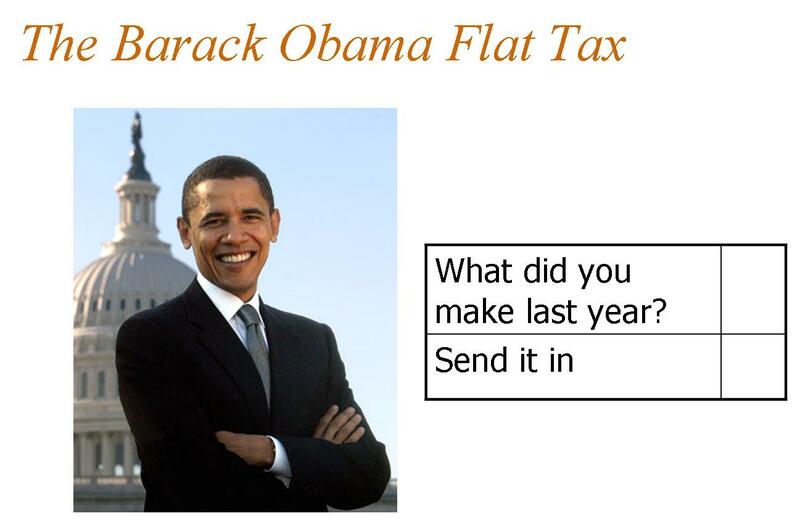 The Barack Obama Tax Reform Plan? In my fiscal policy speeches, I sometimes try to get a laugh out of audiences by including a Powerpoint slide with this image. Leading up to this slide, I talk about the Armey/Forbes flat tax and explain that it would eliminate the corrupt internal revenue code and replace it with a simple 10-line postcard. But I then warn that simplicity is not the same as low taxes and show the Obama slide. But maybe jokes about Obama tax reform were a bit premature. According to the New York Times, the White House is giving serious consideration to a sweeping plan to streamline the tax system. While administration officials cautioned on Thursday that no decisions have been made and that any debate in Congress could take years, Mr. Obama has directed his economic team and Treasury Department analysts to review options for closing loopholes and simplifying income taxes for corporations and individuals, though the study of the corporate tax system is farther along, officials said. The objective is to rid the code of its complex buildup of deductions, credits and exemptions, thereby broadening the base of taxes collected and allowing for lower rates — much like a bipartisan majority on Mr. Obama’s debt-reduction commission recommended last week in its final blueprint for reducing the debt through 2020. Doing so would offer not only an opportunity to begin confronting the growth in the national debt but also a way to address warnings by American business that corporate tax rates and the costs of complying with the tax code are cutting into their global competitiveness. There’s actually much to like in the Administration’s potential plan. Lower tax rates will help the economy by improving incentives for productive behavior. And getting rid of distortions will further enhance growth since people no longer would have an incentive to make inefficient decisions just for tax purposes. And simplification could have a profound impact on cleaning up the horrible mess at the IRS. Moreover, a plan that trades lower tax rates for fewer tax distortions would be a welcome change from the poisonous soak-the-rich tax policy the White House has been pursuing. This sounds like good news, but there’s a catch. The White House is looking at this exercise as a way to not only clean up the tax code, but also as a way of getting more money for politicians. This blog post explains why this is the wrong approach from an economic perspective, but politics will be an even bigger obstacle. The American people want tax reform, but they don’t want more of their money going to Washington. And most Republican politicians have wisely pledged not to support legislation that increases the overall tax burden. So the ball is in Obama’s court. If he genuinely wants to make America more prosperous and competitive, he should move forward with plans to lower tax rates and eliminate tax distortions, but he needs to tell his staff that tax reform should not a Trojan Horse for a tax increase.